I'm grateful to Katharine Murphy for drawing this to my attention, I suppose; but it is rather more your standard press gallery output and less an exemplar of what it might be, which is what I had hoped and suspect she might have hoped, too. Let's not dismiss it out of hand. Bear with me as I pop the bonnet and take it apart, then consider what sort of reporting an event like this might give rise to, from journalists and media companies that knew what they were about and had some conception of customer value. OK, I read Christensen's Facebook page in the original, and it says a lot about him as a politician. Basically, George has stamped his foot and delivered an ultimatum, which was probably meant to sound like strong and principled leadership. Canberra deal-makers hate ultimatums and the drama queens who deliver them. Coalition MPs returned by the barest of margins will not thank one of his party's whips for rocking an overloaded boat in this fashion. That said, there are four issues here. First, superannuation. It's important, and the details have ramifications that go far beyond Canberra, far beyond this term of Parliament, and we really should pay attention to the details. Any details about what this carry-on might mean, Katharine? The Coalition policy places a $500,000 lifetime cap on after-tax superannuation contributions backdated to 2007, increases the concessional tax rate on asset earnings from 0% to 15% for people aged 56-65 in the “transition to retirement” and taxes accounts over $1.6m at 15%. ... and Christensen's Facebook page is full of endorsements of whatever she might say about anything. Why doesn't he stop pretending he's a legitimate member of the Coalition and piss off to the PHONies? Is he playing a longer game like Bernardi, waiting to drop off the Coalition once he has sucked it dry? The novelist Evelyn Waugh once wrote of one of his contemporaries: "To see Stephen Spender fumbling with our rich and delicate language is to experience all the horror of seeing a Sevres vase in the hands of a chimpanzee". There's a certain element of that in knowing George Christensen, and many others no better than him, holds your retirement income and mine and the fate of the government in his hands. Murphy's fascination is understandable, but misplaced. There less drama than you might imagine in a man who talks big but tends not to follow through.Lastly, there's the angle that Murphy takes on all this - the same angle every other press gallery herd animal took - on the horserace. The barely returned Turnbull government and the potential disruption to its agenda, etc. I suspect this is the bit that's meant to take my interest. Um, probably. It's just beside the point. Politicians make deals and break them and carry on - mostly over nothing of enduring significance - all the time. Despite press gallery lore, that's not really where the most interesting story is. The herd are all over that horserace stuff. The story is in what those deals are over, and how the outcomes affect us in ways we may or may not expect. 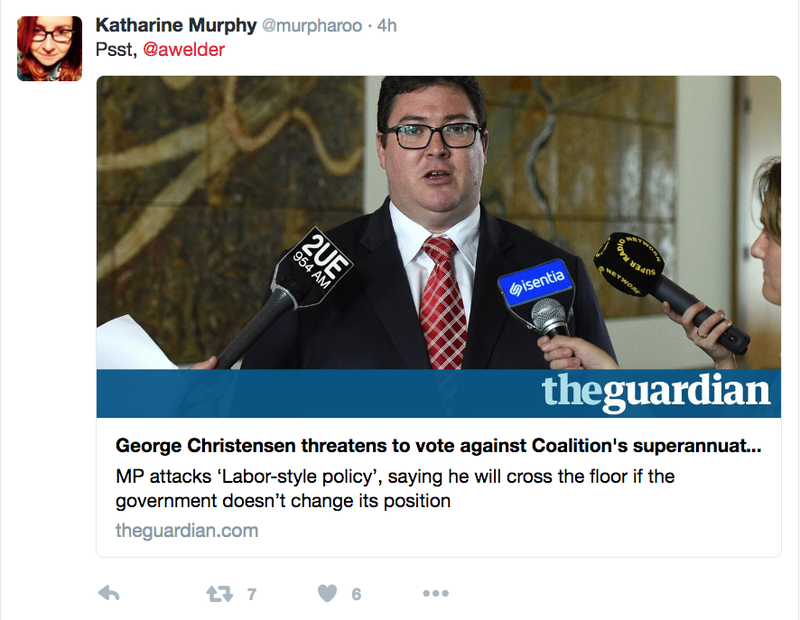 Christensen isn't going to turn government over to Bill Shorten, not over superannuation or anything else. He's seen how conservatives treat Tony Windsor, Rob Oakeshott, or the Job of Sippy Downs, Peter Slipper; neither Christensen nor anyone in this government wants that sort of calumny for the rest of his days and yea unto the seventh generation. The idea that conservatives cross the floor without penalty is palpably false. It's a historical artefact that was binned by John Howard. If your twenty years of observing politics up close has taught you anything, that's one of the lessons you should have learned. If it were no big deal that conservative MPs cross the floor, why even write a story about it?Cory Bernardi has been threatening to leave the Liberal Party for a decade. Like most people (and many dogs, and even some bits of furniture), Bernardi is much smarter than Christensen. If the SA Liberals punted Bernardi he has a much more solid political base to survive and almost certainly get re-elected to form an enduring presence in Australian politics - but still he waits, and waits, and knows any time he wants to stir the pot the entire press gallery as one will run around with their hair on fire. If the LNPQ punted Christensen he'd be finished, flat out making it onto Mackay Council. Christensen has his Facebook page: if Murphy Chan thinks the best use of her traditional media platform is to make more from a gobbet of social media than it can possibly bear, then she is selling that platform short. She's not alone in this belief, and strangely many journalists take comfort from following this trend: whether it's an overpaid presenter on live TV cutting to a smartphone, or radio personalities taking to podcasts to complain about Twitter, nothing diminishes traditional media faster than the impression that they are nothing but relays for where the action really is, on social media. If the traditional media becomes yesterday's social media today, it's finished.This government is less precarious than the one of 2010-13, which Murphy and most of the press gallery reported from up close. The idea that the government might collapse at any minute got very damn boring after months and years where plenty else was happening. It crowded out reporting of actual policy developments every bit as significant as the superannuation reforms under discussion here, developments that could make useful stories today or tomorrow given the right writers. Clearly, the lessons of the abysmal reporting from that time have not been learned.A focus on policy removes perceptions of journalistic bias: can a policy opposed by the Labor party really be a "Labor-style policy" (even if a politician declares it so)? Leaving policy out of your coverage puts it at the mercy of a bunch of personalities that are far less compelling than beleaguered media outlets might hope.As a political correspondent, Murphy Chan should know Christensen isn't much of a superannuation wonk, and isn't much of a politician either; she would serve her readers better by saying so and pointing out why. In terms of this event and where the news value is, the fate of the nation's retirement incomes far outweighs the outbursts of another mediocre Jack-in-office. Journalistic inertia in only being able to cover complex stories in tiresome ways that obscure their lasting significance is to be pitied (to be fair, Murphy's this piece was one of the better examples of a doomed genre). We still need more and better information on how we are governed than the press gallery can provide. Update 27/7: It was remiss of me to overlook the fact this article, while referred to me by Katharine Murphy, was in fact written by Gabrielle Chan. The necessary changes have been made above.My original point stands about the research: reading a Facebook page and taking a gibbering dupe at the words fed to him is not a vindication of journalism but a failure of it. The paragraph on superannuation should have been the core of this story, not a side-effect; we will be enjoying/suffering the results of this for years, and it is only fair for journalists observing from up close to tell us what's going on.A NewsCorp veteran, Chan tends to give politicians the benefit of the doubt and believes she has done journalism by quoting them directly and taking them at their word. Her journalism from beyond Canberra is far better than that from within; she should do more of the former and let it inform any political reporting she may turn her hand to. Murphy was wrong to consider this piece anything more than your standard all-sizzle-no-sausage journalism content.